The Division of Banking, Insurance, and Financial Regulation in conjunction with AARP -VI advises the public of the next general membership meeting hosted by the St. Thomas AARP Chapter #3138. The meeting will be held on Saturday, April 27, 2019at the Schneider Regional Medical Center, Sun Room at 1:30pm. Important information for policy holders previously insured under the Real Legacy Assurance Company whose coverage has been transferred to NEMWIL Insurance Company will be discussed. All policyholders are welcomed to attend to receive detailed information on the claims process. This is the second meeting hosted by AARP-VI. The first meeting was held on March 9th by the St. Croix AARP Chapter. A presentation on the new AARP Homeowners Insurance policy will be made by representatives of NEMWIL Insurance Company to address concerns that members may have regarding the recent transfer. 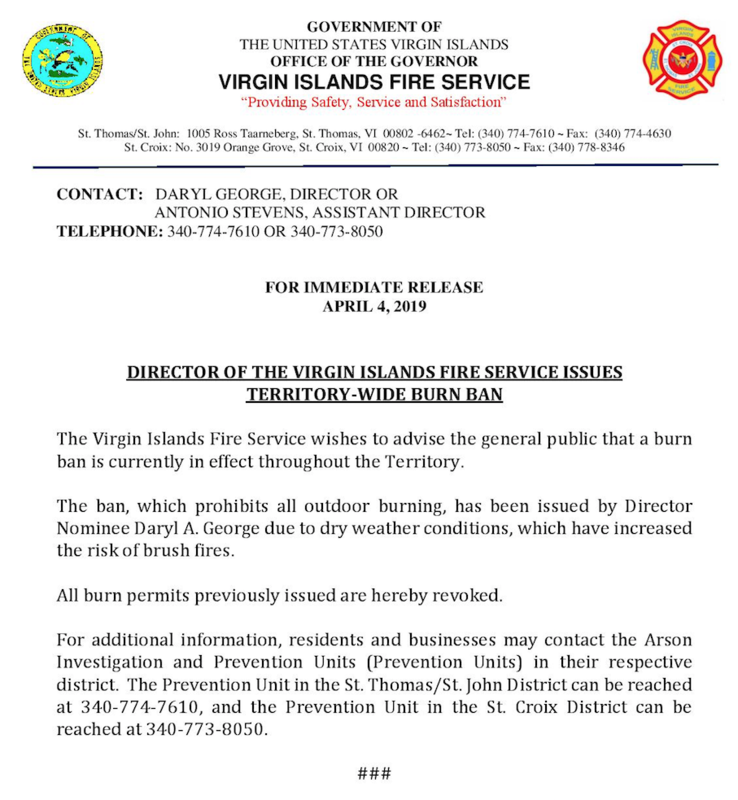 Staff from the Office of the Lieutenant Governor Division of Banking, Insurance, and Financial Regulation will also attend the meeting to answer questions and provide information to those impacted by the change. The Division of Banking, Insurance and Financial Regulation can be reached at 340-773-6459(St. Croix) and 340-774-7166(St. Thomas) for additional information. Our delegate arrived on Water Island on the 9:30am ferry accompanied by staff members Barbara Petersen, Cletis Clendinen, and Kyza Callwood and a security officer. This was Delegate Plaskett’s first visit to Water Island. 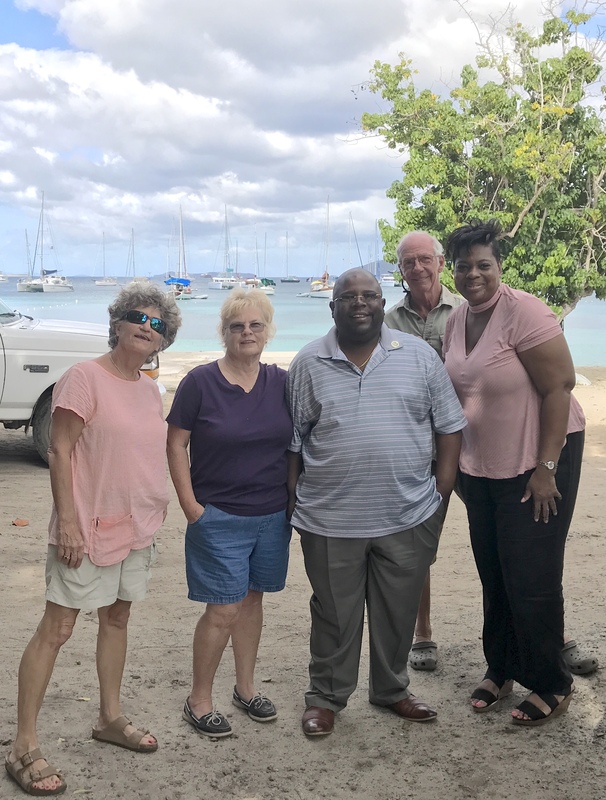 Mary Dunakey, Chuck Gidley and Joanne Bohr conducted a tour of Water Island covering almost all of Water Island and a drive through of Sprat Bay. The roads demonstrated the need for repairs and we asked that the status on FEMA funding to be addressed in the meeting. 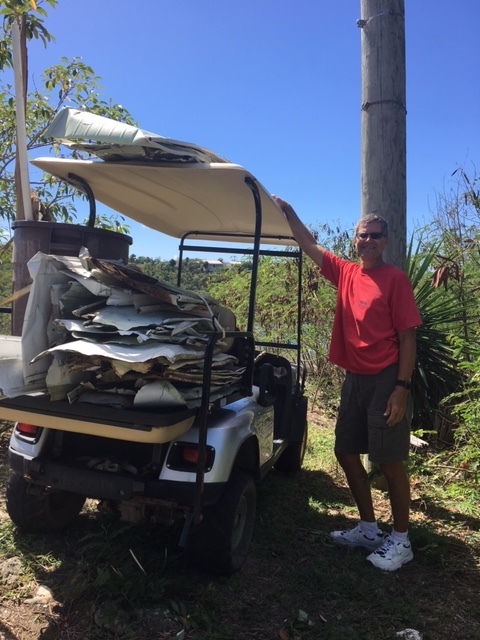 Although not a federal issue per se, we showed her our waste transfer site and critical need for tires/oil and white goods to be removed as EPA issue. In addition, Barbara Petersen was able to give some history of various topics before and during the meeting. We finished with a final tour onto the beach where WICA hosted their lunch which was a good opportunity to chat informally as well. The feedback of the meeting received from our community has been so very positive. “Knowledgeable”, “impressive”, “approachable” were some of the comments. We hope to have our Delegate return, especially for those unable to attend this meeting. 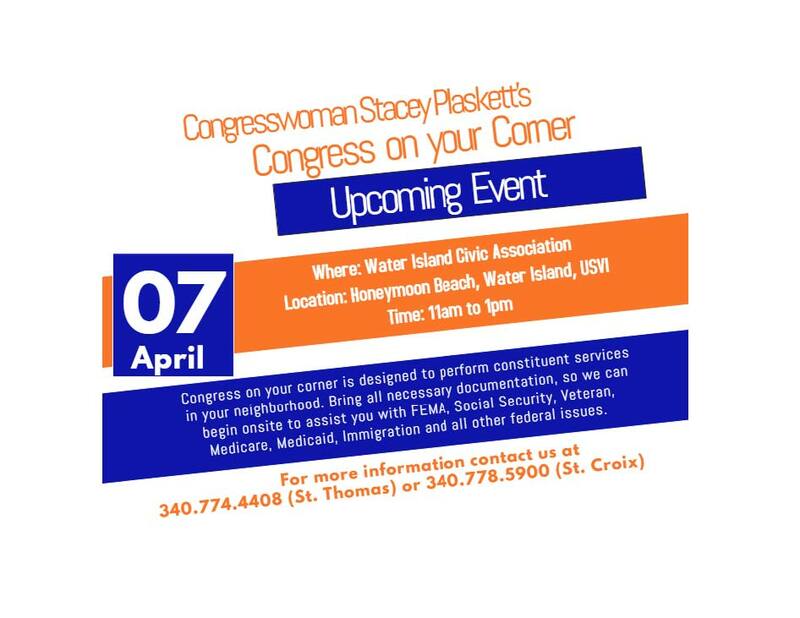 Posted Saturday April 6, 2019 The location to meet Congresswoman Plaskett tomorrow has changed. 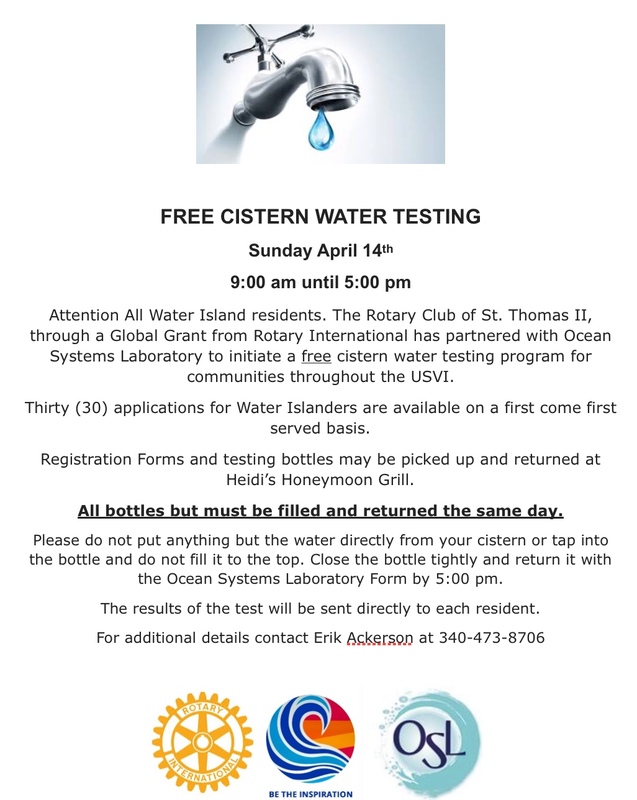 It is now at the Water Island Firehouse at 11AM. Posted March 28, 2019 Mark it on your calendar! 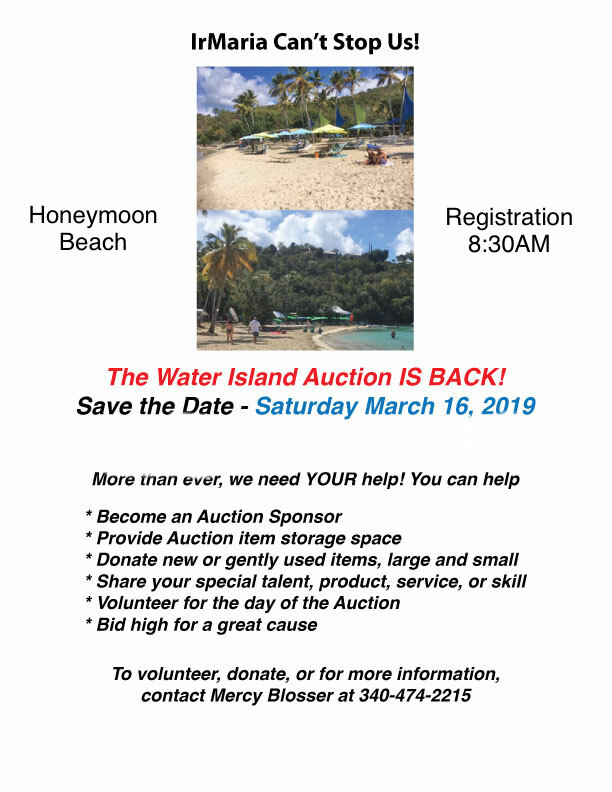 Sunday, April 7, 2019 at 11:00AM on Honeymoon Beach! 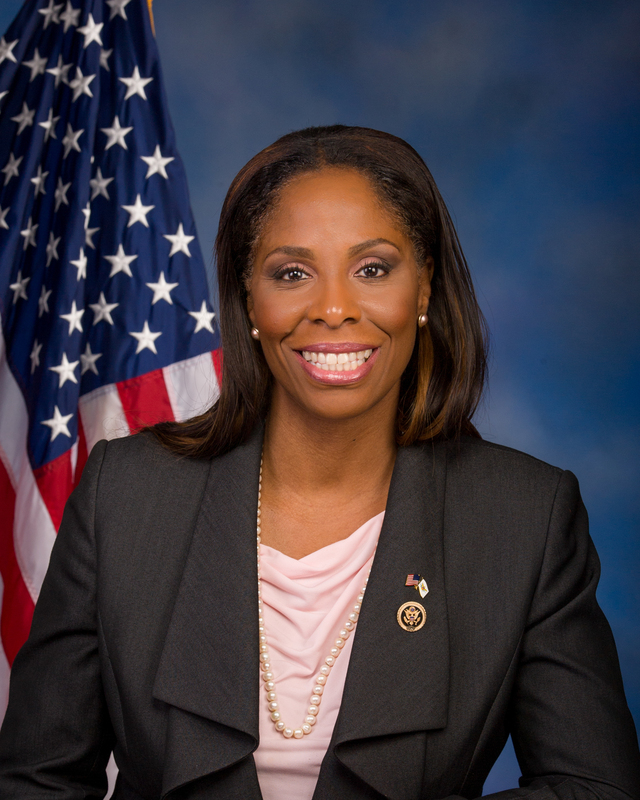 Through the efforts of our WICA president, Joanne Bohr, and Barbara Petersen, Congresswoman Stacey E. Plaskett will visit Water Island to meet our residents. Posted March 22, 2019 It is with tremendous sadness that we announce the passing of one of our longtime residents and dear, dear, friends, Carol Richardson. Carol passed away earlier this week. As we all know, Carol was a tremendously talented artist that contributed her work to the WICA Annual Auction every year. Almost without fail, her beautiful, sought after work, attracted the highest bid for the auction. 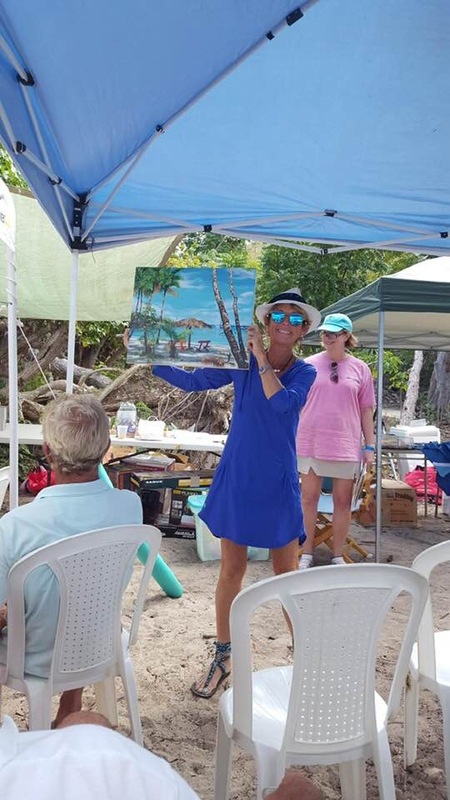 Please join friends and family of our dear neighbor and friend Carol Richardson as we celebrate her artistic talents, her heartfelt love of animals, Water Island and a life well lived. We will be gathering at Heidi’s Honeymoon Grill at 10:30 am on Sunday, March 24th for a Celebration of Life. 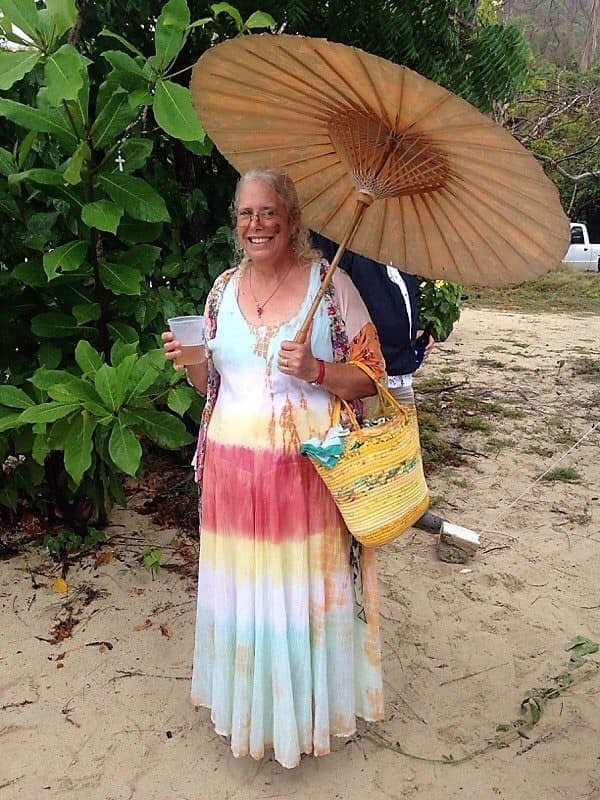 Here is Carol's obituary from the Virgin Islands Daily News. ATTENTION! Be On The Lookout! 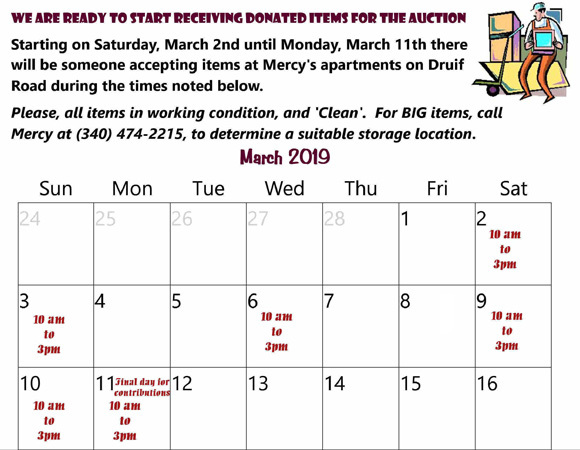 The following people are part of the notorious "2019 WICA Annual Auction Success" This tireless group was led by none other than Mercy "You WILL Volunteer" Blosser. Julie Northup, Christine Black, Jan Robinson, Sue Bubb, Lee Passios, Missy Petit, Jane Wherren, Mary Dunakey, Bob Blosser, Dennis Murphy (AKA "The Auctioneer! ),Ginny Spencer, Bob Bohr, Glen Petit and his "gang" of volunteers to set the tents, Martha Langkammerer, Christi "Vanna Has Nothing On Me!" Roselle, Chuck Gidley, Robin Marion, Eric Bubb, Cristy Carli, Jane Schaffer, Christy Jacobson, AND the infamous "Heidi "I cater an amazing lunch" Erwig. There are probably some other names that have escaped notice because they are so stealthy.When they are identified we will report their names so all know who they are! When you see these people give them a HUGE "Thank You!" for making the 2019 WICA Annual Auction an unbelievable success. Also, thank you to ALL of the Water Island residents and friends that contributed their talent and items. Please don't forget all of the successful bidders at the auction. Well Done To ALL! THANK YOU! Posted March 2, 2019 Drop off times are 10AM to 3PM on the below dates! Last week, we reached out to our Water Island Administrator, Mr Avery Lewis. His office set up a tour for this morning to meet and understand different Water Island Issues. Ms Sheryl Manning, Mr Lewis’ Assistant Coordinator accompanied our Administrator on the tour. David Roselle, Mary Dunakey and I met them off the 8am ferry and gave a little history of WI, including the role of DOI, Hotel Lease and transfer to the US VI in 1996. Mary provided a copy of the transfer deed and the shorelines act regarding development. We drove up Providence Hill, went to the Government offices (Burkhart House) and then proceeded to the fire house. We showed them the WISAR ambulance and firetruck provided by fundraising efforts plus the firetruck from the deJongh Administration. 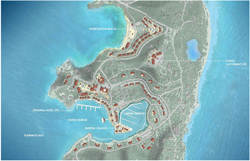 We then travelled to see Flamingo Bay quickly and then to the beach. It was early and nothing was open yet. We told them they would not recognize this beach on cruise ship days once the ships dock. Mr Lewis expressed concerns for the beach environment and noted DPNR is in charge. We had a half hour to chat about priorities. All 3 of us emphasized that Water Islanders work hard to maintain our island and do as much as we can. What we need from the GVI is permission and help with major issues. He assured we would have many visits and he or staff would come over as often as needed or possible. We all expressed thanks for coming so quickly. THE ANNUAL AUCTION IS BACK! 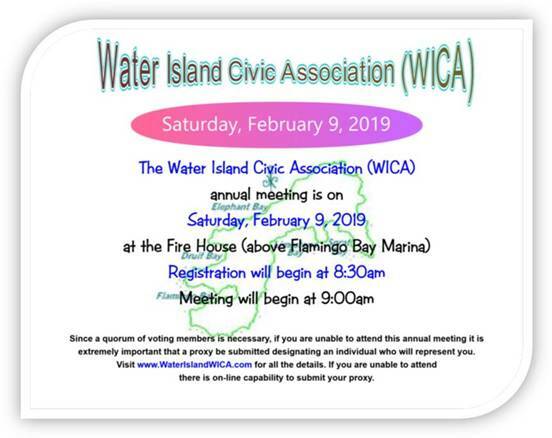 Posted January 11, 2019 If you are a Member of WICA please go to the "Members" area on this site to view and download the 2019 WICA Annual Meeting Package and also to submit your proxy vote for the meeting if you cannot attend.